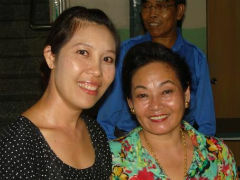 In November 2009, Lorraine Dierck and her team at the Bangkok Mission Centre began a series of Church Planting Movement (CPM) training events. CPM is a rapid multiplication of church growth that sweeps through a people group or a segment of a population and which produces many new, small local churches. A small group of trainees from these training events decided to be serious about praying and working towards the objective of seeing many churches established among the 60 million Thai Buddhists in Thailand and into the surrounding nations. As a result of the initial training, John and Nok Pramuan from Pathumthani church began evangelising training new believers how to share their testimony with their own family and friends. This began a stream of new believers and new churches to the point that the converts are baptising former Thai Buddhists every single day. John and Nok believe that this is harvest time for Thailand and are both fully involved in training church planters and ministering to their needs. Some people are infectious in terms of their passion, enthusiasm and expression. John and Nok are that kind of couple. They are totally convinced about their roles leading a church planting movement in Thailand, and traditionally it has not been an easy place to plant churches. They are a key couple with a great dream and a mighty God who loves Thai people. 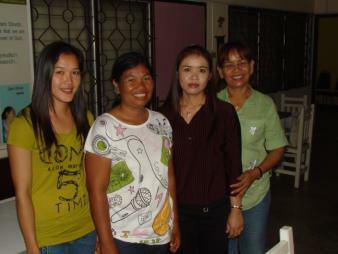 In 2008 Lorraine Dierck started a new work with church planting teams at the Bangkok Mission Centre. The major activity is training and strategy development in partnership with the Good News Team and Muang Thong church. BHW has had a long association with Lorraine and the Good News Team, partnering with her since 2001. Late in 2010 Lorraine presented us with a new opportunity to help support John and Nok in their roles as trainers of the trainers. The direct beneficiaries are John and Nok as it provides financial support for them. It will enable them to train many more people and therefore to reach out to more people with the Gospel of Christ; in reality the beneficiaries will be numerous. John and Nok have an incredible passion and vision for the people of Thailand and are already experiencing extraordinary results. Their CPM model is low cost but results in a wide and dedicated grassroots network that is largely self-sustaining, although does require ongoing support, encouragement and development. This is where John and Nok's experience, ability, enthusiasm and care are invaluable. John is from a Christian family in Chiangrai, North East Thailand. Nok came to know Jesus through an English class Lorraine taught at Pathumthani church around 1990. She met John at the church and they were married shortly after. They have a daughter called Nanaporn. John and Nok have worked with the Good News Team (THA01a) for many years, and still work occasionally with the team there. John has done courses at the Full Gospel Bible College, and Nok has a BA in Business Administration. John and Nok are transitioning from being heavily involved in the ‘front end’ of the church planting ministry to the training and supporting of those in the field. As the generations of church planters expand there is a growing need for support and training both of the new church planters and also of pastors so churches are able to capably support their people and train others to do the same. Their role is to train the trainers who in turn go out to teach others who are leading these new, small local house groups. John especially is involved in an expanding ministry in the north of Thailand, and the couple have been involved in training missionaries from surrounding countries in church planting. They envision continued growth of the CPM network both in terms of people and communities reached. The annual budget for their personal support is $US6,600. In addition to these personal expenses, BHW is committed to provide US$6,600 per year for resources for the training seminars. This helps to cover transport, food, training materials and whatever else is required to get the training effectively delivered.